A Smarter Telescope System. Only from Meade. The LX850 employs a fast f/8 ACF™ optical system with high-contrast baffling that assures crisp, pinpoint imaging to the very edge of the field. The all-new OTA features an internal Crayford-style, zero image-shift focusing system with a two-speed, 7:1 control. Constructed of machined stainless steel and aircraft grade aluminum, the LX850 mount presents a rock-solid platform with precision roller bearings on both axes and a 1.75" stainless steel R.A. shaft. Its .68" diameter brass worms and 5.8" diameter, 225-tooth aluminum gears deliver smooth, precise movement with up to a 90 pound instrument load. A fully-computerized GoTo mount with GPS, the LX850 comes with a database of over 144,000 objects. All this set atop a new super-stable tripod. With the combination of the finest optics, a robust German equatorial mount and the revolutionary StarLock system, the LX850 is the smartest and most complete astro-imaging solution available. 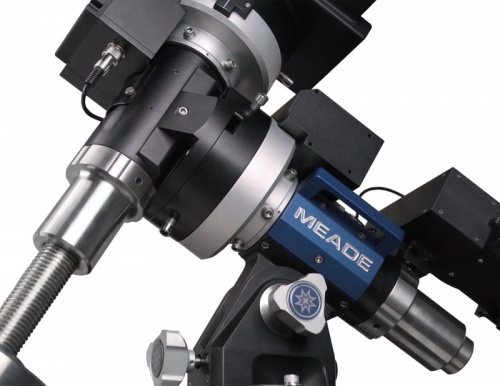 Meade Instruments proudly introduces the new standard in astrophotograhic and visual performance, the LX850. Includes StarLock dual imager integrated full time guider, Ultra Precision Pointing and Assisted Drift Alignment, 5.8" 225 tooth polished bronze worm/gear drives with low periodic error, internal cable routing, GPS receiver, AutoStar II GOTO system with over 144,000 object library, heavy-duty adjustable height tripod with anti-vibration pads, Universal AC Adapter, telescope to computer USB cable and AutoStar Suite software. The LX850 mount, constructed of machined stainless steel and aircraft grade aluminum is a rock solid platform for the most demanding applications, with a 90 pound payload capacity and pointing accuracy as good as one arcminute. Features include precision roller bearings on each axis, a 1.75 stainless steel RA shaft, 5.8" main gears, fine manual adjustment controls on both axis, illuminated reticle output port. Mount main body weight is 55 pounds. The fully height adjustable (29 to 45") tripod features massive 3" diameter legs for rock steady performance and weighs 36 pounds. Includes single 26 pound stainless steel counterweight, additional weights sold separately. LX800 mount shown in photo, LX850 mount similar. 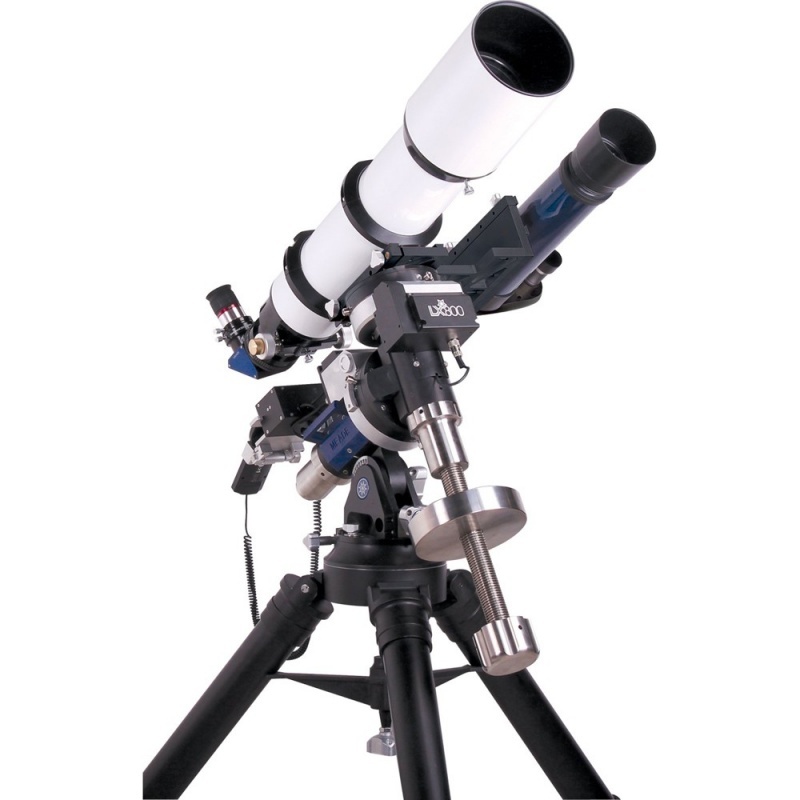 Telescope comes fully equipped with a Meade Series 5000 2" diagonal prism featuring enhanced 99% reflectivity, Series 5000 HD-60 25mm eyepiece, 8x50 viewfinder with quick release bracket, and hard case for the APO optical tube assembly. Total Instrument Capacity	90 lbs.